PF Olsen is seeing many examples of blocks of forest land being harvested and not replanted. 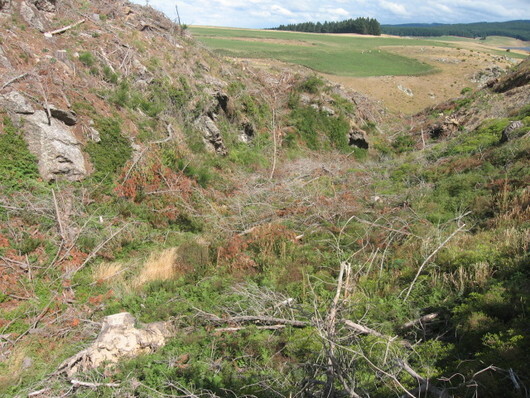 There are also many areas in New Zealand where widespread soil erosion could be mitigated, and/or catchment water quality could be improved with forest cover. This, along with increased conversion of forest to dairy land use, means New Zealand's plantation forest area is in decline. Post-1989 forest land allows land owners to earn carbon credits (NZUs) from forest growth. However, because emitters can import environmentally dubious "hot air" carbon credits (ERUs) New Zealand has a very low carbon price (currently about $3/NZU). It is noteworthy that New Zealand is the only compliance market in the world to allow the importation of such carbon credits. The stated reason from the government for allowing the importation of these units is to protect New Zealand consumers from undue price increases as a result of a higher price for carbon. The reality is that the price of electricity had $25 carbon built into it in 2008 (remember the one-off and large electricity prices at the time) and has not been reduced since, even though emitters can pick up the cheap ERUs for $0.20/unit (or NZUs for $3). Pre-1990 forest land: This is land on which forest growing cannot earn carbon credits, and if deforestation occurs, the land owner needs to account for the loss of carbon. The current very low carbon price is resulting in accelerated deforestation of some forest land, mostly for conversion to dairy farming. This might be a good outcome economically, but it also greatly increases net green house gas emissions and nutrient loadings on waterways. Neither of these impacts is adequately accounted for in terms of environmental sustainability. Much pre-1990 forest land is being harvested and replanted, particularly that land owned by long-term forestry investment entities. However, there are also large areas, most notably in Northland, where after harvesting the land is being left unplanted and unused. This is fundamentally due to the estimated returns from commercial forestry (based solely on revenue generated from timber sales at maturity) only being about 4-6%. We know that forestry punches well above its weight in economic efficiency and has a gross domestic product per hectare many times that of drystock pastoral farming (see Clarky's Comment Wood Matters Issue 54. Isn't it therefore an enormous opportunity cost to the economy to have thousands of hectares of land become unproductive. Even worse, after several years of neglect, these areas become so over-grown with weeds that clearance costs for any land use become prohibitive. The land's productive value is lost for a very, very long time. After harvesting, vigorous regrowth of vegetation progressively escalates the costs of re-establishing a forest. Solutions to this situation revolve not only around continued research and development into improving forestry's economic performance, but also governmental recognition of forestry's high economic efficiency (GDP per hectare) and unrecognised ecoservices (soil, water, species diversity, carbon). Post-1989 forest land: The drivers are different here. As part of New Zealand's prior alignment with the Kyoto Protocol, carbon sequestration of such forests is recognised by allowing carbon credits, or NZUs, to be earned by forest owners. In 2010-2012 this stimulated increased planting, mostly on marginal farmland, based on NZUs having a value of over $20. This was forecast to increase estimated returns from 4-6% to 10-12%; high enough to attract new investment. Consistent with the government's stated intention of increasing new planting, there were several years of relatively strong new planting activity – levels not seen since the early 1990's. Much of this was undertaken by specialist carbon investment vehicles responding to the policy settings in the belief that they would be long-term. However, now that the carbon price has been allowed to drop so dramatically, not only has new planting completely dried up, many of the forests planted by the carbon investors are for sale. The government can't do much about the cost of land, which for new forest planting is driven by the market of pastoral farming. However, it can do something about the price of carbon. Having an ETS with an absurdly low carbon price adds overheads without changing behaviour. It's worse than having no ETS at all considering the enormous resources MPI has invested in administering the scheme and investment dollars misspent by those responding to the initial policy settings. This is surely an opportunity for the government to review its position and create an ETS which starts to create changes in behaviour that are consistent with making real progress in reducing New Zealand's greenhouse gas emissions and makes our reduction targets an achievable goal, instead of a bunch of "hot air".